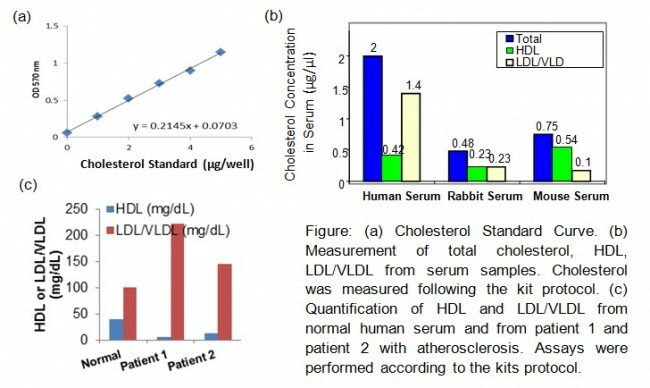 HDL and LDL/VLDL Quantification Colorimetric/Fluorometric Kit | K613 | BioVision, Inc.
Regulation of HDL (high-density-lipoprotein)-cholesterol and LDL (low-density-lipoprotein)-cholesterol plays a central role in various disease developments. It is well known that low levels of HDL and high level of LDL are associated with an increased risk of cardiovascular events. 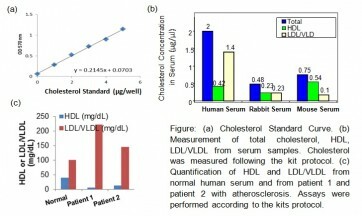 BioVision’s HDL and LDL/VLDL Cholesterol Quantification Kit provides a simple quantification method of HDL and LDL/VLDL after a convenient separation of HDL from LDL and VLDL (very low-density lipoprotein) in serum samples. In the assay, cholesterol oxidase specifically recognizes free cholesterol and produces products which react with probe to generate color (570 nm) and fluorescence (Ex/Em = 538/587 nm). Cholesterol esterase hydrolizes cholesteryl ester into free cholesterol, therefore, cholesterol ester and free cholesterol can be detected separately in the presence and absence of cholesterol esterase in the reactions. Can tissues be used with this kit? Finely minced tissues can be homogenized using the assay buffer and then the same protocol can be followed as that for serum for HDL/LDL separation. Which anticoagulant should be used to collect blood to be used with this kit? Any other anticoagulant but EDTA is fine. Ideally Heparin would be the anti-coagulant of choice. Why is EDTA-plasma not ideal for this assay? EDTA is not ideal for measurement of HDl/LDL in samples. EDTA plasma has potential disadvantages that have discouraged its use. Inadequate mixing with EDTA can result in microclots. Also, EDTA osmotically draws water from red cells, diluting the plasma constituents. Can the separated HDl/LDL/VLDL be used for LC-MS or HPLC? We have not tested the components in an HPLC system. This is optimized as a cell based assay in a plate format. Components in the precipitaion buffer can potentially interfere in HPLC or LC-MS applications. What's the advantage of the K613 precipitation buffer over, say, dextran/Mg or an Immunoprecipitation reagent? The K613 precipitation method is based on the use of water-soluble non-ionic polymer. The primary advantage of our precipitation buffer over dextran/Mg or other IP buffers is that the constituents are benign. The components in our buffer have no or very little propensity to interact with proteins in the sample solution and can specifically precipitate out desired sized molecules. 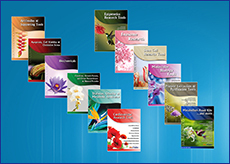 Our reagents ensure precipitation and concentration beyond the limit of solubility of the precipitants. Why is there higher free LDL than total LDL in some samples? Possibilities: 1. The free cholesterol in these samples after treatment with the esterase is membrane/lipid associated thus making it difficult to detect. 2. The cholesterol esters can be associated with serum lipids in these samples and therefore inaccessible for the cholesterol ester to convert to free cholesterol. Adding a small volume of detergent to solubilize the lipids might help. This could increase the reading for the total cholesterol. If there is any NAF in the sample (NAF being frequently used as a phosphatase inhibitor) this can inhibit the cholesterol esterase which could lead to these results. Add NP-40 at 0.05% concentration in the assay buffer and then mix with the sample before adding to each well, the idea being to keep the lipids solubilized and not in rafts/other lipid structures trapping the cholesterol in them. The kit K613 has a shelf life of 12 months from the date of shipping when stored at -20C throughout. The probe, cholesterol esterase and the enzyme mix will have to be stored at -20C (in aliquots of necessary) and used up within 2 months after reconstitution. Can this kit be used without separating HDL, LDL/VLDL? Total cholesterol is made of High density lipoproteins (HDL) and Low/very low density lipoproteins (LDL/VLDL). If the HDL and LDL/VLDL fractions are not separated using the protocol on our Datasheet, total cholesterol (without esterase) and cholesterol esters (with esterase) will be measured. Upon separating the HDL and LDL fractions results can be assigned to the specific HDL or LDL/VLDL fractions. To extract the lipids Folch's method was used and the lipids were resuspended in isopropanol. Are these samples compatible with K613? Samples resuspended in Isopropanol might not work with this kit. The reaction mechanism is designed to be in aqueous solution. Cho, Haaglim et al. (2017) ENOblock, a unique small molecule inhibitor of the non-glycolytic functions of enolase, alleviates the symptoms of type 2 diabetes, Sci Rep. 2017 Mar 8;7:44186. Sirois, Francine et al. (2017) Comparing expression and activity of PCSK9 in SPRET/EiJ and C57BL/6J mouse strains shows lack of correlation with plasma cholesterol, Mol Genet Metab Rep. 2016 Dec 10;10:11-17. Apaijai, Nattayaporn et al. (2016) Effects of dipeptidyl peptidase-4 inhibitor in insulin-resistant rats with myocardial infarction J Endocrinol. 2016 Jun;229(3):245-58.